Take a look at the following spreadsheets of GDP from 2001 to 2010, in chained 2005 dollars to account for [price] inflation. 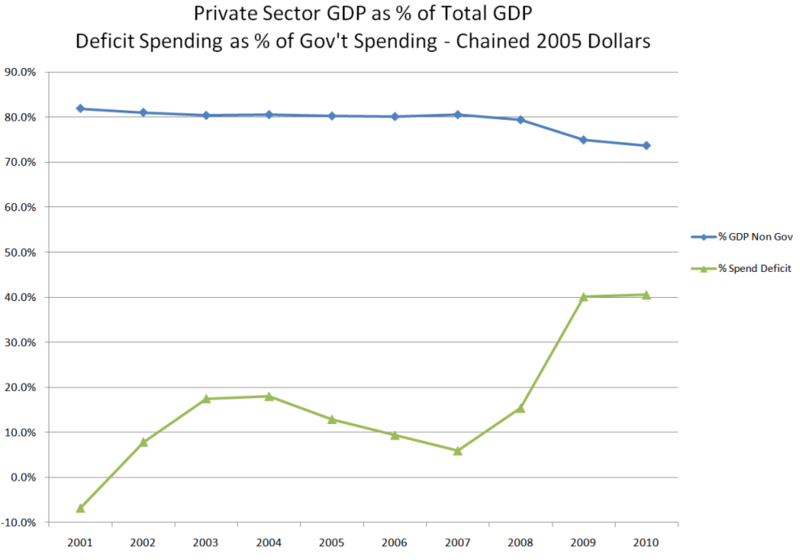 The above chart clearly demonstrates that there really is no recovery, just increased federal spending and debt. Private sector GDP continues to shrink as the above chart and following table shows. 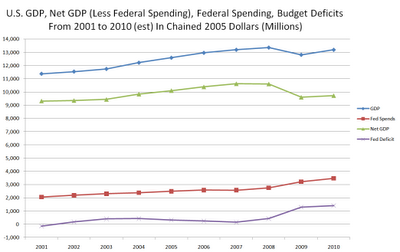 Moreover, over 40% of government spending is deficit spending. That increase in deficit spending accounts for the alleged rebound in GDP. Clearly that deficit spending is unsustainable. How much of that increased government spending made it into your pocket or benefited you in any way? 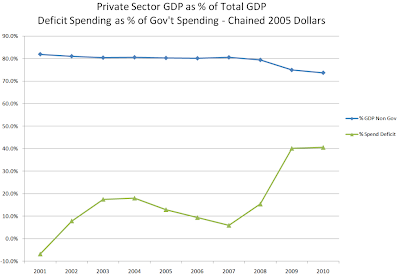 While your are pondering that, remember that all government spending adds to GDP whether or not anything is actually produced. These charts help explain Good News: The Great Recession is Over; Bad News: It Doesn't Feel Like It. So far, we do not even have an admission by the President, by Congress, or by most economists as to what the problems are. Instead everyone wants to "stimulate" something, typically by throwing money at problems. This is why the problems are unlikely to be fixed, and this is why we are likely to remain in a stagnant economy that produces few jobs for the remainder of the decade. While the recession is over, it certainly does not feel like it. Moreover, because we fail to address the structural issues, the odds of slipping back into another recession are exceptionally high. Neither Keynesian stimulus (deficit spending) nor monetary stimulus (Quantitative Easing) have done anything to speed up the recovery. In regards to the latter, the QE Engine Revs, but the Car Goes Nowhere. Just as happened in Japan, all we have to show for our stimulus is bigger and bigger deficits with a corresponding increase in the percentage of revenues needed to finance that debt. All this talk of a "recovery" is nonsensical. 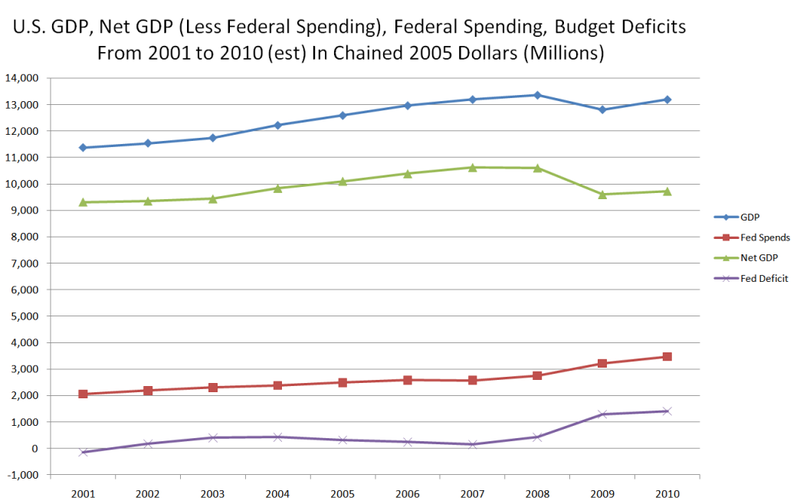 Careful analysis shows the alleged recovery is nothing more than an illusion caused by unsustainable deficit spending. Meanwhile, the real economy is mired at the 2004 level. Simply put, the recovery "feels bad" because there is no recovery in the first place, only a statistical illusion of one.